When Firoz Kassam stumped up the Â£1 being asked by outgoing chairman Robin Herd to assume control of Oxford United in April 1999 the tune being sung by the clubâ€™s PR operators cooed a fresh harmony that promised to deliver the Uâ€™s from the threshold of financial ruin. 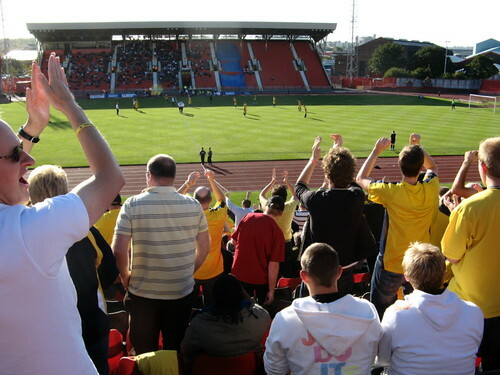 Memories of fans attending matches with buckets to collect hand-outs that would keep the players wages rolling in were replaced with the promise of sustainability, as Kassam wheeled and dealed with creditors to shrink a crippling debt of Â£15million into something around which a future could be built. Relegation to the third tier barely matted the gloss of what was hailed as the early steps in a revival for a club that had sat proudly in the first division as recently as 1988. A new stadium, on hold since the stagnation of the Herd era, was given clearance to continue work. The yellow of Unitedâ€™s badge, for a fleeting moment, glowed gold. Fiscal consolidation never did translate to a revival on the pitch. As the 2013/14 season gets under way Oxford begin a thirteenth consecutive year in exile from the top three divisions, with a spell in the non-League still providing a haunting legacy of the end-times of the late nineties, and to further muddy the clubâ€™s relationship with its own past their one-time saviour Kassam looks all set to wilt the foundations of a long-term recovery. This week Kassam applied for a hearing with Oxford City Council that could potentially reverse the decision taken in May to place the stadium that still carries the former ownerâ€™s name under protection as an Asset of Community Value (ACV). Under the current ruling any attempt to sell the property off to a third party can only occur after the community â€“ represented in this instance by OxVox, the Oxford United supportersâ€™ trust â€“ has been given due notification and the opportunity to prepare a competing bid. Kassam, having once masterminded Unitedâ€™s survival now finds himself staring down his former club from the opposite corner, challenging the council over the stadiumâ€™s protection order. The big question rumbling around the terraces is why. Without a controlling interest in the running of the club, speculation is rife that Kassam sees a potential conflict of interest with the supporters trust on the horizon, and that in seeking a review he is taking preventative steps to protect himself later down the line. As a business interest the Kassam Stadium represents to Firoka, the Kassam-fronted holding company, regular rents or else an asset to be sold off to a buyer. If the latter, OxVox might have genuine cause for concern. Kassam is at least sentimentally bound to the club by what they achieved together over the last decade and is unlikely to act out in a way that would make life difficult for the Uâ€™s. Should his business interests take a turn and render the ground a more saleable asset those sentiments are unlikely to stand in the way of any deal to offload the stadium. So far there are no prospective buyers on the landscape, nor anything explicit from Kassam to suggest he intends to sell up. But there are few friends in the shark-pit of a real estate recession, especially when fortunes can turn on a sixpence and leave a community suddenly deprived of one of its great social bastions. Considered in strictly corporate terms it makes more sense to view the real enemy as the fickle markets that so readily remould and manipulate the priorities of stakeholders. Kassam did great things for Oxford, both the club and the city, and the stadium is a fitting legacy of his contribution. It would be a sorry way for that partnership to end if that same gift rented them apart for good. As Firoz Kassam is probably the most hated figure in the history of Oxford United, this latest move isn’t quite the surprise it’s being painted as. Kassam’s legacy to the club was to remove it from its traditional home (tidying a nice profit from the sale of the old ground in the process); move it into an out-of-town, unfinished white elephant that it doesn’t own and was quite obviously built on the cheap, leaving the matchday experience one of the poorest in professional football; and to systematically destroy the club’s infrastructure, leaving it facing non-league oblivion just seven years after he bought the club in the Championship and with no base to rebuild from. Any ‘sentiment’ he might have for the club hasn’t prevented him from leaching us of Â£600k a year in rent to play in our own stadium (while doing less than the bare minimum in upkeep – OUFC have just had to pay out Â£50k to relay the pitch at his stadium) and he would quite happily sell up to any party prepared to meet his outrageous Â£13m+ valuation of the ground.